I can not believe that It’s soon that time of the year again- but my favorite! Christmas!! Every year my kids and I do Christmas crafts and my kids also make a handmade gift for their grandparents and godparents. This post is a cumulation of the grandparent/godparent gifts, fun Christmas activities to do together and other Christmas crafts we’ve done in the past along with a few new ideas I have found and would like to try. 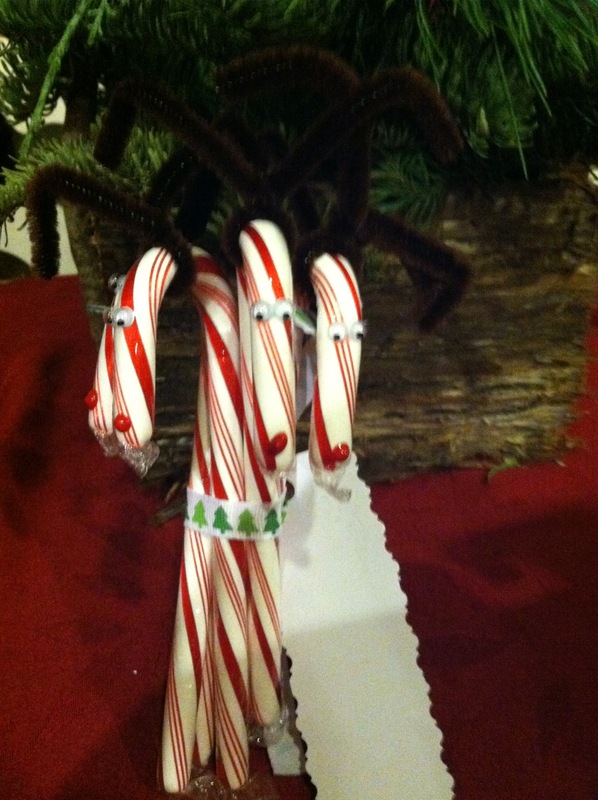 We made these to give as favors to guests who attended our Christmas Open House Party. 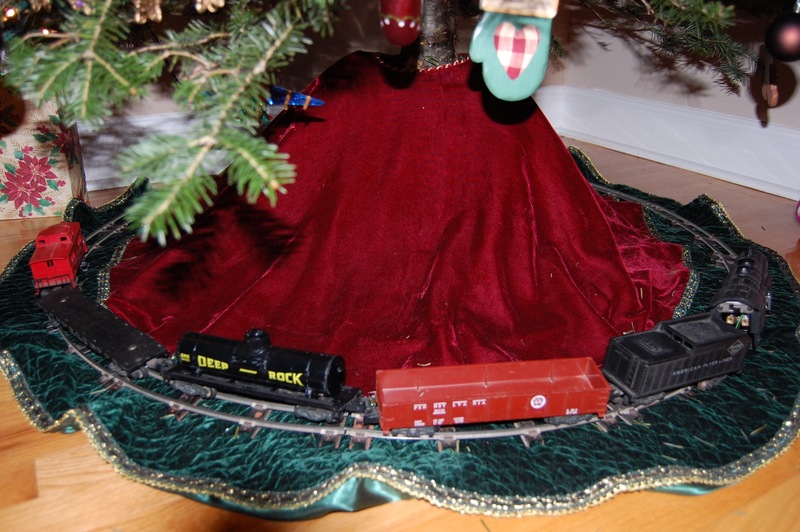 They were very easy to make and look really nice on the tree. 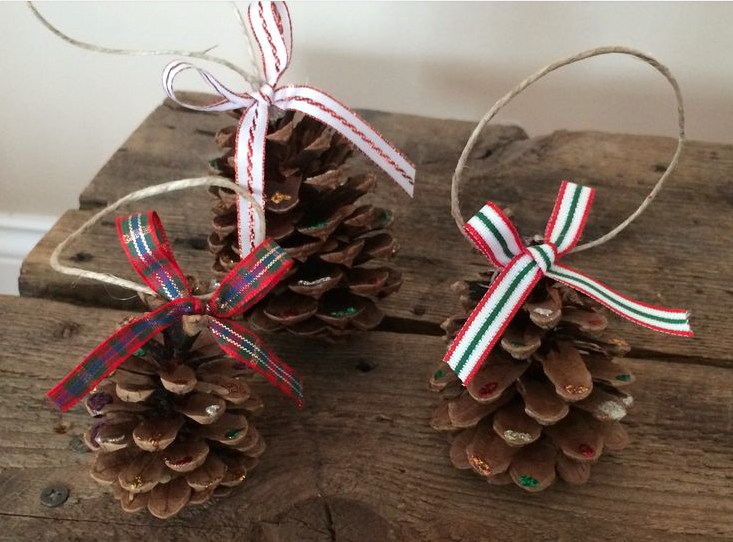 If you can’t find any pinecones in your yard, you can purchase them at a craft store. We put small dabs of colored glitter glue around the cone and hot glued a bow made out of Christmas ribbon and a piece of twine as the hanger. This was another favor we made to give out to guests after one of our Christmas Open House Parties. We glued on google eyes and small red pom poms for the nose. Then we used brown pipe cleaners to ties on the top as the antlers. I then grouped them and wrapped with a Christmas ribbon and each one had a tag with the family’s name on it. This was a grandparent/godparent gift. 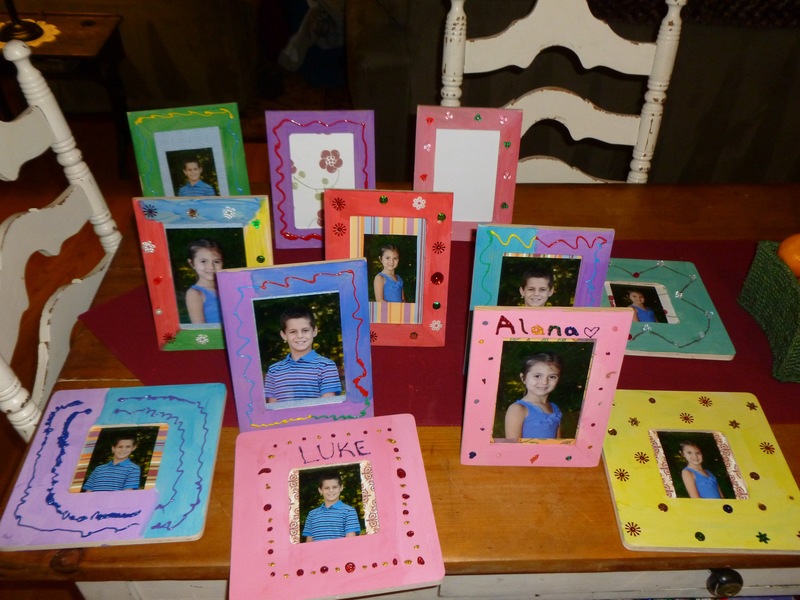 I picked up a bunch of wooden frames from the craft store and the kids painted and decorated each one and then we put their school photo inside and they made really nice gifts. I saw this idea on Pinterest and liked it, but modified it a little bit (our project is the picture on the right). We actually did this project during one of our homeschool days. As you can see, I cut out a different shaped tree, gave them glue and buttons. Both kids and I came up with completely different designs and it was fun to ask people to guess who made which tree. 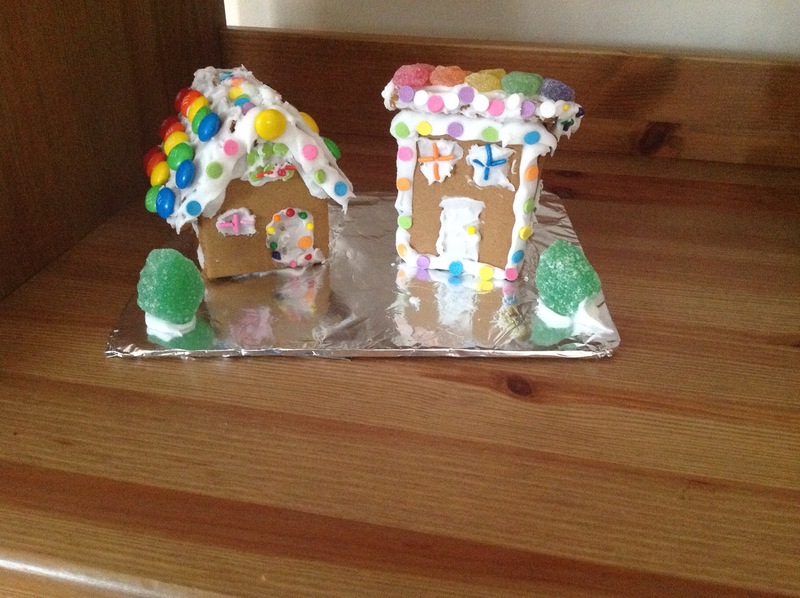 Of course you can always do the classic gingerbread house. I love getting the houses that are pre-iced because it saves a lot of time and in my case, a lot of mess! In the past years I have seen many variations pop up as well including Mickey Mouse house, princess castle, trains, etc. You can find the kits anywhere, I have seen them in Christmas Tree Shop, Joann Fabrics, Michaels, Costco and at most grocery stores. I discovered a few years back that having one house was not going to cut it in my house. My son likes to follow the picture on the box, while my daughter tends to want to do her own thing. So I started buying the village. It comes with four houses. 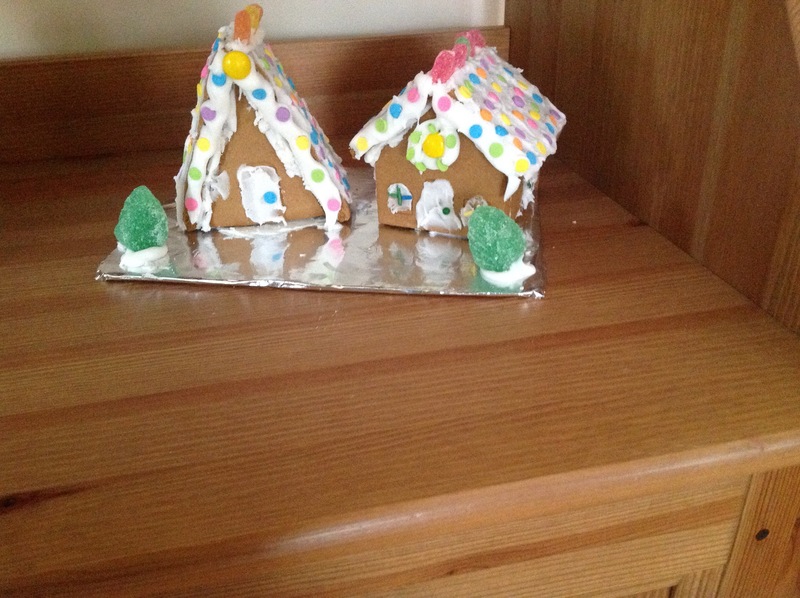 They each get two and can decorate however they like. You do however have to put these together yourself, which in my experience was a little messy and frustrating. The triangles tend to slide off. Since we don’t eat them, maybe this year I will hot glue it and then cover in frosting. I was cutting a pineapple and the top was so perfect and looked like a Christmas tree to me. I started thinking about what I could do with it instead of throwing it out. I decided to make a bird feeder out of it. I spread Crisco shortening on the leaves to provide a base for the bird food to stick and then sprinkled in plenty of bird food. I topped it off with a piece of pineapple that I cut into a star (every Christmas tree needs a star)! I placed it out on the back deck and the birds loved it. I found this on Pinterest and thought it was a really cute craft to make (picture linked to source). I save all my corks and this is a great way to reuse them. I haven’t made this yet, but might use the idea for one of our grandparent/godparent gifts in the future. This is another idea I found on Pinterest, but have not made yet (picture linked to source). I think these are very cute to use as Christmas decorations and look easy enough to make that the kids can definitely help! I hope you find a useful and fun idea here! 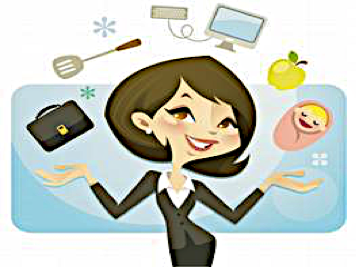 If so, let me know how it works out for you! Happy Christmas crafting! This entry was posted in Imperfect Crafter, Parenting Fun and tagged christmas, christmas crafts, christmas crafts with kids, christmas decorations to make with kids, handmade christmas gifts, holiday, holiday crafts, holiday crafts for kids, homemade christmas gifts, kids crafts.